1. Receive this report for information. The Baby-Friendly Initiative (BFI) is a global standard that was established in 1991 by the World Health Organization (WHO) and the United Nations Children’s Fund (UNICEF) to improve worldwide breastfeeding initiation and duration rates. Organizations that receive a BFI designation demonstrate compliance through implementation of standards outlined by the WHO/UNICEF global criteria within the Canadian context. Starting in 2012, the Ministry of Health and Long-Term Care (MOHLTC) requires all public health units achieve and maintain the BFI designation. In March 2013, Wellington-Dufferin-Guelph Public Health (WDGPH) received this designation through an extensive external assessment by the Breastfeeding Committee for Canada (BCC).2 Annual reorientation to the BFI Policy is a requirement in maintaining our BFI designation as outlined in the Accountability Indicator Status Report for the MOHLTC. BFI designation is reassessed every five years. In order to maintain the BFI designation, WDGPH is required to submit annual self-reporting of breastfeeding statistics, bi-annual BFI status report, and reassessment every five years to BFI Ontario and BCC. The MOHLTC also requires public health units to submit a BFI Status Report, outlining the key activities undertaken for the maintenance of BFI designation. As part of these reporting mechanisms, WDGPH highlights progress on specific activities related to BFI compliance to promote, protect and support breastfeeding, including creating supportive environments, strengthening community actions, public awareness and health education, and evidence-informed practice. In addition to ongoing maintenance activities, WDGPH is in the process of preparing for reassessment in early 2018. The BFI is a global standard that was established in 1991 by the WHO and UNICEF to improve worldwide breastfeeding initiation and duration rates. BFI was established to protect, support and promote the initiation and duration of breastfeeding globally and also to support mothers in making informed choices around infant feeding free from commercial influences.1 BFI supports all families in infant feeding, regardless of their feeding choice. In March 2013, WDGPH received the BFI designation through an extensive external assessment from the BCC. At the time of designation, WDGPH was one of nine health units in Ontario to achieve this designation.2 WDGPH will be reassessed in 2018. In order to prepare for the upcoming assessment, WDGPH must undertake the specific activities, outlined in Appendix A. The BFI agency policy acknowledges WDGPH as a baby-friendly organization and that breastfeeding is the natural way of providing infants with nutrients they need. This policy is available for review by any member of the public. A user-friendly version has been developed for members of the public, and is posted in public spaces at each office (Appendix D). WDGPH also has a policy to support infant feeding in the workplace, which promotes and supports breastfeeding, and expressing breastmilk on its premises. The policy supports all individuals with infant feeding on its premises, regardless of their feeding method. The policy outlines the support provided for employees to continue infant feeding upon their return to work. These policies and procedures are reviewed on an annual basis to ensure that they reflect current expectations for the BFI designation. Annual reorientation to the BFI Policy is a requirement in maintaining our BFI designation as outlined in the Accountability Indicator Status Report for the MOHLTC (Attachment E). These policies are sent to staff for their review once a year. They can be also be accessed anytime by staff through a link on the agency intranet site to SharePoint, where all Policies and Procedures are posted. As of 2012, BFI status became an accountability agreement indicator to the MOHLTC for the Family Health Standard. The MOHLTC requires public health units to submit a BFI Status Report, outlining the key activities undertaken for the maintenance of BFI status. As part of these reporting mechanisms, WDGPH highlights progress on specific activities, summarized in Table 1. Professional training/ education for public health nurses working with clients prenatally and postpartum. Hospital partnerships and outreach to midwifery practices. Promotion of the importance of breastfeeding and infant feeding recommendations, through prenatal education and other social marketing activities, such as World Breastfeeding Week. Postpartum contact and support from public health nurses, through Healthy Babies, Healthy Children, breastfeeding clinics, and KIDS LINE. WDGPH is currently conducting the Infant Feeding Survey (IFS), which gathers information from mother’s with a newborn baby who consent to participate. This survey was first implemented by WDGPH in 2007, and again in 2012. Once data collection is complete for the 2016 IFS, it will provide WDGPH with longitudinal data that will allow us to monitor infant feeding trends over time. Mothers are asked to complete the survey within four weeks postpartum, and again at 2, 4, 6, 12 and 18 months, depending on their infant feeding practices. The initial survey asks mothers about their pregnancy, early postpartum experiences with their baby, how they are feeding their baby, and the people, services and resources that they have used to support infant feeding. Subsequent surveys ask similar questions as the baby grows and develops. The survey tools were based on the work of a Locally Driven Collaborative Project to standardize infant feeding surveillance across the provinces. Data collection for the IFS began in February 2016. As of October 2016, the initial survey sample, included 327 mothers, which is approaching the target of 400 mothers. The initial, 2, 4, and 6 month surveys have been implemented, with the 12-month survey due to launch in February 2017. To supplement the Infant Feeding Survey data, WDGPH assesses infant feeding during the postpartum contact for all mothers who have consented to a phone call from a Public Health Nurse. Table 2 summarizes key components of this assessment. This data provides us with an ongoing account of breastfeeding rates in our community. WDGPH offers breastfeeding clinics at six locations across WDG, including Guelph, Fergus, Orangeville, Mt. Forest, Palmerston and Shelburne. These clinics are staffed by Public Health Nurses. Table 3 summarizes breastfeeding clinic statistics for 2012 to 2014. This data collected by WDGPH is shared with our community partners involved in the breastfeeding collaborations to inform collective service planning that supports breastfeeding in our community. Moving forward, WDGPH will continue to protect, promote and support breastfeeding through ongoing staff and public education, community collaboration, evidence-informed service planning, and infant feeding surveillance. These activities will support Wellington-Dufferin-Guelph Public Health’s reassessment for the Baby Friendly Initiative designation in 2018. Expectant parents are aware of the importance of breastfeeding, the mechanics of breastfeeding, and where to obtain assistance with breastfeeding. There is an increased rate of exclusive breastfeeding until six months, with continued breastfeeding until 24 months and beyond. Breastfeeding women have improved knowledge, skills, and confidence. 1. The Board of Health shall conduct epidemiological analysis of surveillance data, including monitoring of trends over time, emerging trends, and priority populations in accordance with the Population Health Assessment and Surveillance Protocol, 2008 (or as current), in the areas of: Breastfeeding. 4. The Board of Health shall work with community partners, using a comprehensive health promotion approach, to influence the development and implementation of healthy policies and the creation or enhancement of supportive environments to address: Breastfeeding. 5. The Board of Health shall increase public awareness of: Breastfeeding. 7. 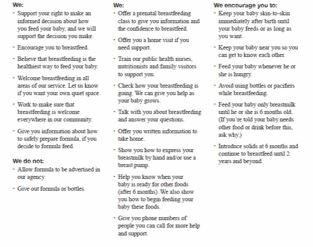 The Board of Health shall provide advice and information to link people to community programs and services on the following topics: Breastfeeding. Healthy Equity Impact Assessment has not been completed for BFI. Currently, breastfeeding programs and services are offered at a population level with access to all mothers and infants twelve weeks or younger. There are certain populations that experience an increased risk for poor breastfeeding outcomes. These populations include: women who have a lower income and less educational attainment, women who must return to work earlier, are unmarried, lack social support, women who have poor maternal and mental health, and women who smoke during pregnancy.7As WDGPH continues to collaborate to ensure breastfeeding supports are reaching those most at-risk for poor breastfeeding outcomes, targeted programs, services and strategies may be utilized to complement the current universal approach. Programs such as the Healthy Babies, Healthy Children and Pregnancy to Parenting further support these efforts to reach identified priority populations. Child health guidance document [Internet]. Ministry of Health Promotion; May 2010 [cited 2015 Mar 2]. Completion of a self-appraisal tool that identifies areas requiring more work. This includes a Document Review and Site Visit. Three day process that involves visiting all offices and interviewing staff and clients. If criteria are met a BFI re-designation is obtained. Annual completion of self-monitoring reports. BFI Interim Report every two years. Place babies in uninterrupted skin-to-skin1 contact with their mothers immediately following birth for at least an hour or until completion of the first feeding or as long as the mother wishes: Encourage mothers to recognize when their babies are ready to feed, offering help as needed. Provide a seamless transition between the services provided by the hospital, community health services and peer support programs. Apply principles of Primary Health Care and Population Health3 to support the continuum of care and implement strategies that affect the broad determinants that will improve breastfeeding outcomes. 1. No advertising of these products to the public. 2. No free samples to mothers. 4. No company mothercraft nurses to advise mothers. 6. No words or pictures idealizing artificial feeding, including picture of infants, on the labels of the products. 7. Information to health care workers should be scientific and factual. 10. All products would be of a high quality and take account of the climatic and storage conditions of the country where they are used. Public health units must check off all requirements completed for the time period from January 1,2016 to June 30, 2016 according to the BFI Status Report Reference Guide 2014, posted to the Directory of Networks (DoN) Data Management site and the Family Health Network Collaborative site. A copy of the BFI Status Report submitted to the ministry for BFI baseline, and all reporting periods can be accessed through the PHU folder on the DoN. - Continue infant feeding surveillance. WDGPH is in the process of collecting data on a cohort of individuals in the immediate postpartum period and again at 2, 4, 6, 12 and 18 months. - Finish development and implementation of “my breastfeeding plan” in the prenatal period in WDG. Resource to be made available to expectant parents through primary care providers, prenatal care providers, at prenatal classes and on the WDGPH website. - Work with local businesses to display the international breastfeeding symbol to encourage breastfeeding in public spaces. - Implement new social media outreach mechanisms to connect with parents and parents-to-be about many topics including infant feeding. - Continued participation in committees to support Guelph General Hospital, North Wellington Healthcare Alliance and Headwaters Health Care in working towards BFI designation.